Athens is a city of contradictions: its exquisite ruins, sublime metro, sophisticated nightlife, its graffiti, grime, and packs of wild dogs. 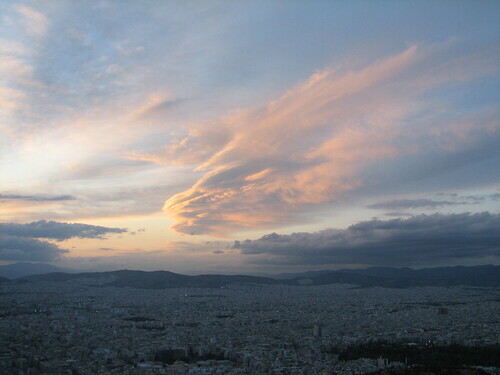 I’d been to the “glorious city” once before in March 2009, not long after some riots. On this visit, the city seemed quieter, calmer, less crowded, probably the result of cool weather and the financial crisis. 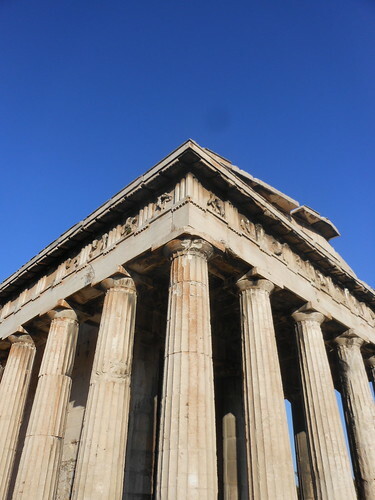 A highlight of the agora is the Hephaisteion, possibly the best-preserved temple in existence. We took taxis to the National Archaeological Museum, but before going inside, each of us had a restorative beverage of choice: coffee or milkshake. 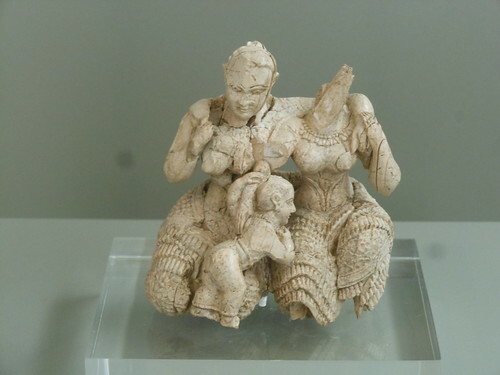 I've already mentioned some of the Mycenaean treasures on display at the museum in previous posts, but here's a favorite object of mine in ivory. The women's flounced skirts are Minoan in style. 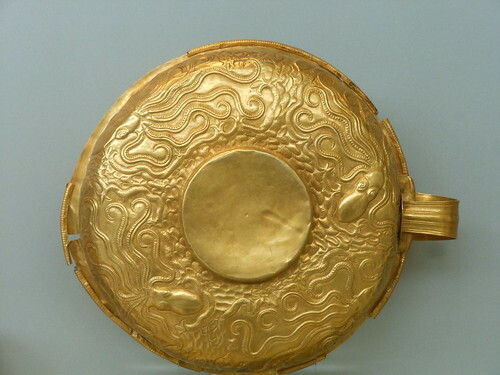 This jaw-dropping golden cup, found in a grave at Dendra near Midea, features swirling octopi. We left the museum just as it was closing up at 3:00. In the afternoon, my fellow travelers exhibited their shopping prowess. I was on the look out for a good tea shop, but instead we found the motherload of chocolate shops -- about 5 of them all on Voulis Street. On the final day, we visited the impressive Acropolis Museum, where you can walk around the frieze panels and metopes all while gazing up to the Parthenon or out across Athens. 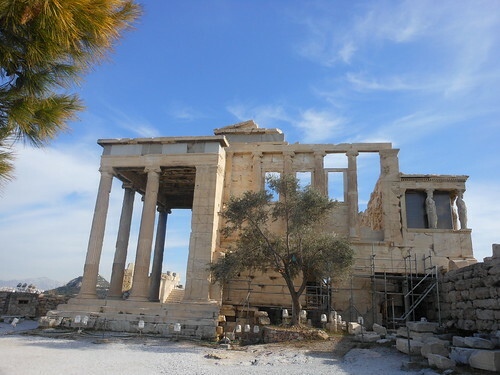 From the museum, one can only go to the Acropolis, where reconstruction and conservation work never ends. 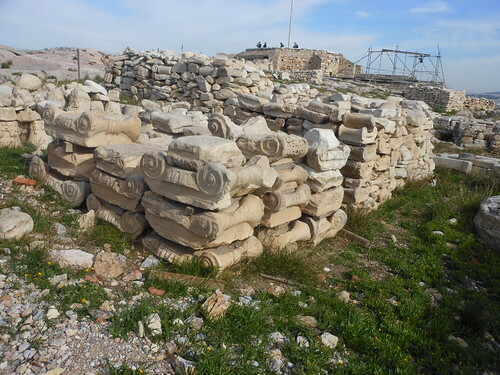 I loved the piles of Ionic capitals. The Erechtheion remains one of the most creative and engaging architectural masterpieces of all time (at least in my opinion). 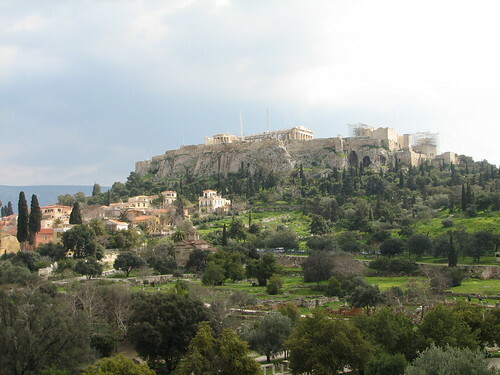 As our exploration of the Acropolis neared its end, I could sense a kind of giddiness in our group. Unfortunately, I could also sense a cold beginning to creep upon me. I still needed to buy some gifts and I was eager to have a quiet afternoon, so I set off alone. Sunoikisis is offering another study/travel program that begins May 22, 2012 and lasts for 3 weeks. 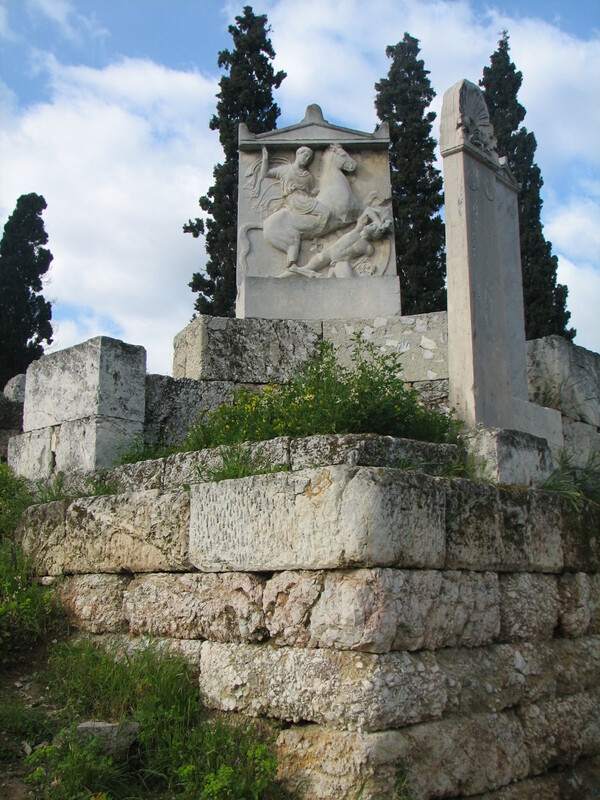 Students will visit the sites mentioned in these posts as well as Santorini, Olympia, Delphia, and other important sites in Attica, such as Sunion and Eleusis. Learn more about the trip.